Hinged Flood Gates are similar to our other flood barrier systems, except they are permanently installed at the opening location. Thus, they are basically stored in their open position. This system can be custom designed to suit any width opening within reason and can be supplied in either a single or two leaf configuration. For larger gates, central support wheels can be fitted for safety and ease of deployment. Once swung shut and locked, an effective seal is created with no further interaction required. Hinged Flood Gates offer quick reaction time. 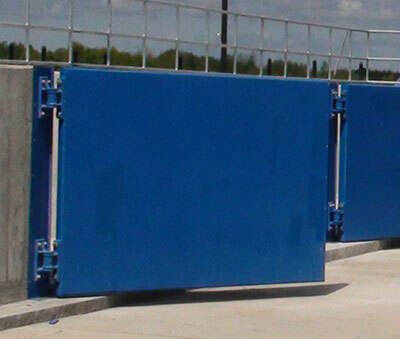 Because this flood barrier is permanently installed and stored at the opening location, it offers a quick reaction time. The gate simply needs to be shut to create a seal. This is critical when a flood event threatens. To reduce the aesthetic impact of this barrier, the front surface of the gate can be colored or covered so that it matches the mounting structure. Typical hinged flood gate installation. Please click image to enlarge.